Nothing has been able to get me out of the house this week, away from madly watching films preparing for the Blue Mountains Film Festival. Not even a couple of my most anticipated films of the year have been able to pry me out of the house and into the cinema. Nothing would break my resolve. Nothing that is, except that the Arc Cinema at the National Film and Sound Archive brought To The Wonder (2012) to the big screen here in Canberra. I have no real idea why Terrence Malick’s latest film was given essentially no cinematic release here in Australia. But given I consider Tree of Life (2011) one of my top 5 favourite films of all time, this was worth heading out of the house for. There are plenty of critics of To the Wonder who would suggest that this was not time well spent. I am not amongst them. Mark me down in the minority who love this film and who believe it is an honourable entry into one of screen history’s more remarkable bodies of work. I actually think that the narrative of this film is more straightforward than most of Malick’s work. It is a love story, the peaks and troughs of love and passion. Furthermore this narrative is brought to life relatively simply, so that it is easy to follow. Don’t get me wrong, the presentation is slow (some would say laborious) and unorthodox (except for Malick), but the telling, the central thread, is simple enough. Characters played by Ben Affleck and Olga Kurylenko (Neil and Marina the credits tell us, but I don’t recall that coming up in the actual film) fall in and out of love. That is it. In some ways much of the film is incredibly schmaltzy, but told in the unschmaltziest way imaginable. In the end it strikes the nuance that occurs in real life. Feelings are not just torn in two. There is not just love or just hate between two people. But the two feelings fighting and scratching against each other. If you have ever watched and enjoyed a Terrence Malick film, you know the kind of visual splendour you are in for with this film. However here he brings some decidedly different images. It is not a simple examination of natural or rural environs. The incredible imagery covers a lot of ground – cities, towns, ranches and a focus on mining. These images are used to examine the effect that all of these aspects of society have on the environment around them. In a way, just as frightening as the snarling mining equipment is the house that Neil and Marina live in, right on the edge of the urban sprawl. A lone outpost of suburbia, the interim space between the rural and the urban. But soon to be joined by innumerable other ‘little boxes all the same’. One last note on the visual side of things, I was lucky enough that the Arc cinema has 4K digital projection and it was the sharpest I can recall a film looking. Stunning projection. In terms of performances, it is Olga Kurylenko who carries the film. Affleck is there, and he is good. But his is a secondary role, not submissive but kept intentionally quiet and distant. Kurylenko though is very good in the difficult role of a woman struggling to find her place in a relationship, let alone the world. Thematically the film covers a lot of ground. At its heart it is about the transformative power of someone new in your life. Even if the initial jolt of change that person brings cannot be entirely sustained, it does not mean you have not been changed forever. At heart, no matter where the film goes, I think the opening reveals Malick to be a real romantic. Above all, he is a believer in the redemptive power of love. 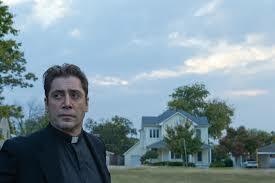 Perhaps the most ponderous aspect of the film is the role of the local priest played by Javier Bardem and that of faith more broadly. His is a character that almost exists on the fringes of the film. He visits the poorer parts of the local community, attempting to minister his good word. He does not appear very successful. It is apt that he is on the fringes of sorts, as the overwhelming sense you get from the character is that he is ultimately a very lonely one. He never entirely integrates into the narrative just as he has never fully integrated anyone else into his confidence. The role that this character plays in the film is one of the aspects of it that I will be most keen to take another look at when I next check the film out. To the Wonder is a film that you do have to actively watch, but not in a way that makes it a chore. You just have to be on guard, as oftentimes fleeting scenes and images are some of the most important or emotive of the whole film. 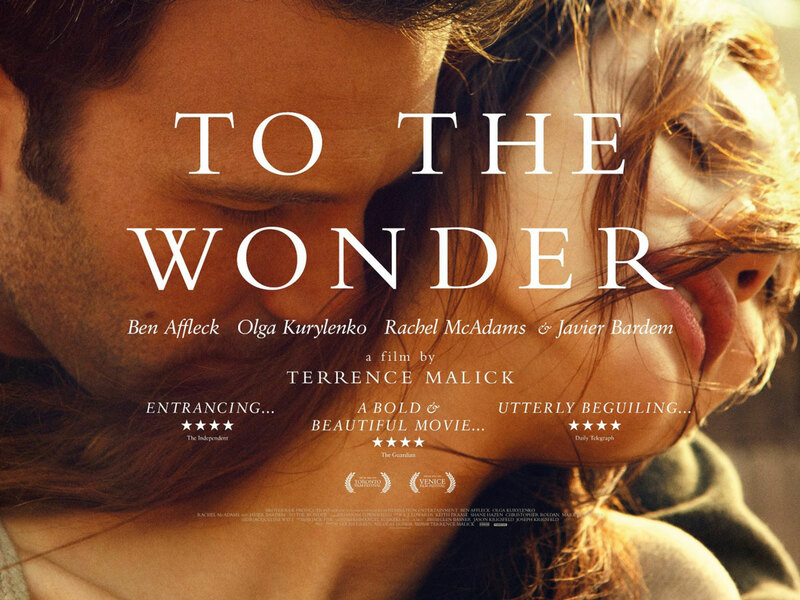 Like all Terrence Malick films, To the Wonder will require repeat viewings to garner all of its meaning. But the first viewing for me was an extremely enjoyable one, and like all of the great director’s films, for me it was an almost transcendent one. Malick has the power to make me deeply think like no one else working today. All the while putting some of the most awe-inspiring images that you will ever see in a cinema right there in front of me. As a big fan of Malick, I’m really looking forward to this one. I’m finding it quite difficult to get hold of though. Like yourself, I regard one of Malick’s movies as a personal favourite. I loved the The Tree of Life but I still think his best is The Thin Red Line. I love The Thin Red Line. So powerful as a war film, but like no other war film that has ever been made. I could make an argument for probably every film that Malick has made (aside from Days of Heaven which I haven’t seen) as being my favourite. Really looking forward to this one as well. I absolutely loved Tree of Life. Glad to hear you were a fan of Tree of Life as well man. This one has had a pretty mixed reception, but I think you will like it. Hope I’ll get to see it soon. Thankyou sir. And yes, you do need to watch Tree of Life. Cheers Julie, glad you enjoyed it. Thanks man, glad you enjoyed it too. Nice review mate. I’ve only seen The Tree of Life of Malick’s work and I still have no idea whether I liked it or not! This looks similarly polarising. Haha, that is a somewhat understandable response to Tree of Life. Perhaps try Badlands next. I absolutely love that film, and it has a more conventional narrative than most of Malick’s work. Everytime I see a positive, well-articulated review like this for To the Wonder, I get a bit more excited. The early buzz was quite negative, suggesting it was “too Malick-y” (which is certainly possible – I love the man’s work, but it’s easy to see him ending up on the wrong side of the artistic/pretentious line). Looking forward to seeing this with glowing responses like yours. Look forward to hearing your thoughts. The film is very Malicky. But for me, not too much so. I definitely don’t think it is any different to Tree of Life in that regard. Cheers Cindy, thanks for sharing your thoughts. I’m all about Terrence Malick’s “visual splendor.” Whether the film works for me (Days of Heaven [possibly in my own top five] and Badlands) or not (The Tree of Life), I can always appreciate his visual style. Plus I usually like Ben Affleck, even if the movie’s not so good. I wish I could see To the Wonder on the big screen, but even if I have to settle for a DVD, I’m certain that any opportunity to delve into one of Malick’s little universes would be worthwhile. Your descriptions of To the Wonder as almost transcendent and awe-inspiring have convinced me that I definitely need to see it ASAP. Glad to hear it was a convincing review. I agree totally that Malick’s films rest totally on your opinion on his visual style. I think for me, I am so taken in by that style, that I am willing to forgive any of the films flaws. Days of Heaven is the only film of his that I haven’t seen. Everything else, I would consider to be 4 1/2 or 5 star films. He is definitely my favourite living director, perhaps my favourite ever. I would recommend seeing Days of Heaven on the big screen if at all possible, but on the other hand, it’s so great that you shouldn’t wait to see it. I will do my best, but not sure how likely that is to happen. I too was looking forward to seeing TTW at Arc. Although I wouldn’t say I was a “fan”, I have always liked Malick’s films, and am always prepared to see another one (as infrequent as they come along). Malick ‘s movies has always struck me as “good but not quite there as great” – they always feel like a Kubrick-but-not-quite achievement (I know it’s unfair to compare directors, but I can’t help it with this case). However, there are many auteur directors for which their less favourably reviewed movies has been my favourites (e.g. my favourite David Lynch movie is INLAND EMPIRE, and I will defend Kubrick’s EYES WIDE SHUT any time, any place), so I thought this might be the one Malick that I end up loving. Unfortunately, I have to count myself as one of the detractors. It certainly was beautiful to watch, but a movie always needs something else, and this one didn’t have it for me. After an hour, I had got to the stage where I was restless in my seat, and my mind kept wandering to other mundane aspects of my life, and that is always a sign that a movie has failed (I will always give myself over to any movie from the start but, if it fails to give back to me and keep my attention, then I start to get resentful). So I left at that point. Hi Travis. Thanks so much for taking the time to comment and apologies for my slow reply. Whilst personally I love Malick and everything he puts on screen, I definitely get what you are saying about feeling his films are good but not great. I think we all have our directors that have that effect on us. Scorsese is one for me who, whilst I will always go and see anything he makes, his films are always good but not great for me. You know it is weird, for some reason my mind can wander in a Malick film. I find it does more with Tree of Life than it did with this one. But for some reason, I find that part of the charm. I find that I can slip out of his films momentarily and then just slide back in. Your comment got me thinking, I wonder who the director is who has caused the most walkouts in cinema history. Malick may be up there on a walkouts per people who actually bother going to see the film basis. I recall seeing Tree of Life (in a premium cinema that someone had forked out for) and someone walking out. I was being my usual nerd self and sitting right up the front for To The Wonder so did not see you leave. Cheers again for reading and commenting. Always appreciated (especially from presumably a fellow Canberra local). Cheers Brookie. It is really great stuff. Should be out on DVD soonish. If you haven’t already, you should try and see the Tree of Life. Definitely not a relaxing with beers (or hangover for that matter film), but incredible to look at in the same way as this. In my top 5 of all time.